TONNER-VINTAGE CLUB EXCLUSIVES- Low Limited Edition. Cloths and trunk were Made for JANE but fit BETSY & BARBARA & DRU McCall too! All items are new and NEVER used Never Removed from shippers till now. These items were only available to club members at random times over the years Doll club existed. 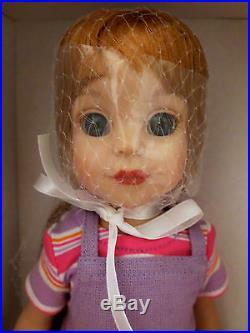 JANE DOLL 14 inches with BENT KNEE LEGS never removed from original box. Our little Jane is your favorite child doll – exclusive to Tonner Collectors Club Subscribers only. She comes dressed in a lilac jumper with appliqué flowers, striped tee shirt & tights, and shoes. 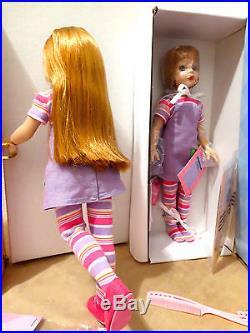 Jane is 14″ tall and can also wear clothes designed for 14″ Betsy McCall. 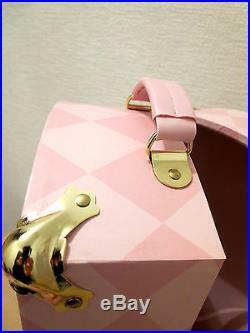 Custom PINK JANE TRUNK in shipper LIMITED EDITION never removed from shipper -new NRFB -in pristine clean condition. The Jane doll trunk that was only available through the Tonner Collectors Club, and it is the same size as the Betsy McCall trunk (16.5 x 7 x 6.5 inches). 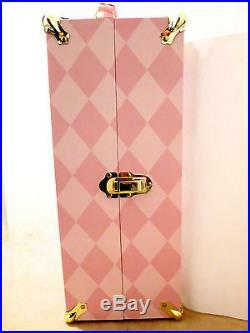 Jane’s trunk is pink with harlequin checks, sturdy metal corners, Jane logo, nice handle and plenty of room inside for one or two dolls, several hanging clothes and accessories in the drawer. TWO exclusive to TONNERCLUB – Jane OUTFITS. (fit 14 inch child dolls Betsy & Barbara & DRU). These two outfits are from the “JANE VISITS PARIS” collection and a very small limited edition of 300 each. Nrfb paris in the spring. 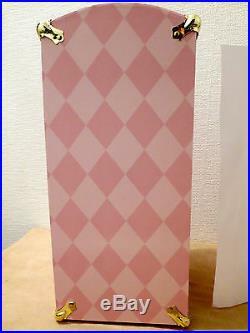 It comes with a sequined and bead embroidered mini dress, belt, pink plaid hooded raincoat, tights, shoes and purse. Nrfb spring the traveler. A diagonal plaid jumper with belted drop waist and pleated skirt, plaid beret, striped tights, blue knit top and blue mary jane shoes. How french is that. (fits many other 14 inch dolls). Not included -2nd Jane doll removed from box to show bent legs -long hair. As well as one other single outfits listed separately. All outfits fit 14 inch Betsy, Barbara, and Dru Mccall and may fit other 13-14 inch dolls as well. Trunk can accommodate 2 dolls and many outfits. 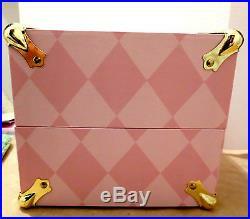 Drawers for tights and accessories. Please do ask any questions and. Take a look at the special limited edition collector Jane dolls I will have for sale in my store as well. ALL SALES ARE FINAL. I DESCRIBE ACCURATELY -PICTURES ARE PART OF MY DESCRIPTION. This ITEM was stored in a professional storage facility -undisturbed until now. No sun damage -no odors -smoke mildew or otherwise -no pets. In the event I agree to a return. As the item has left my controlled environment and cannot be listed as such and therefore. SHIPPERS SENT WRAPPED IN BROWN PAPER -ITEMS WITHOUT SHIPPERS. SENT WRAPPED IN BUBBLE WRAP THEN BROWN PAPER. ALL SENT WITH TRACKING AND INSURED. PLEASE CONTACT ME WITH ANY QUESTIONS. The item “Exclusive Tonner Club Members -JANE 14NRFB doll, New Trunk, 2 New Outfits” is in sale since Sunday, September 10, 2017. 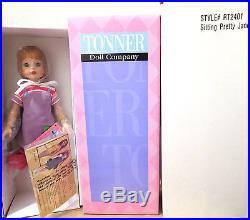 This item is in the category “Dolls & Bears\Dolls\By Brand, Company, Character\Tonner\Betsy McCall Collection”. The seller is “iluvmycouture” and is located in Ontario. This item can be shipped worldwide.